Bones of an entirely new but already extinct genus of gibbon have been discovered in China, revealing the magnitude of human-caused extinction of primates, according to a study by UCL and ZSL (Zoological Society of London). The discovery was made by scientists while studying the contents of a burial chamber in Shaanxi Province, central China and the findings were published today in Science. The ancient tomb dates from around 2,300 years ago and possibly belonged to Lady Xia - grandmother to China's first emperor, Qin Shihuang, the leader who ordered the building of the Great Wall of China and the Terracotta Warriors. 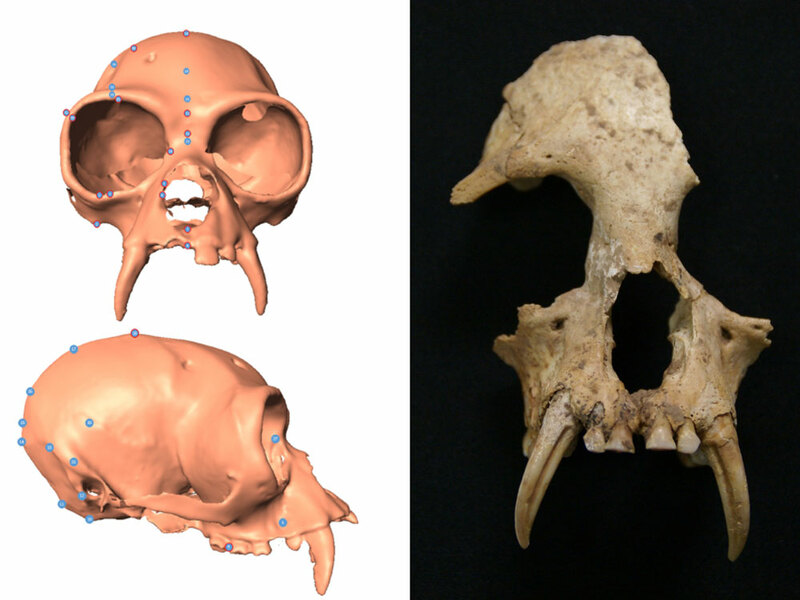 Professor Helen Chatterjee (UCL Genetics, Evolution & Environment), an expert on gibbons, worked with colleagues to measure key points on the skull and teeth found in the tomb which were then compared to the dimensions found in the four genera of gibbons living today. Their in-depth analysis revealed that the skull and molars differed by so much that the bones belong to a separate genus to today's gibbons. "It's not surprising that Junzi imperialis is distinct from current gibbon populations as the mammals naturally become isolated from each other in tree tops and can't cross gaps in the canopy. Even today's four genera have different numbers of chromosomes," explained Professor Chatterjee. Gibbons are the smallest apes and are characterised by their distinctive song and long arms - which they use for moving through the forest canopy by a form of locomotion called brachiation. They have played an important role in Chinese culture for thousands of years, being present in ancient literature and art. However, despite probably having a venerated status, Junzi became extinct due to past human activities, likely to have included deforestation and hunting. All of the world's apes - chimpanzees, gorillas, orang-utans and gibbons - are threatened with extinction today due to human activities, but no ape species were thought to have become extinct as a result of historic hunting or habitat loss until now. The demise of Junzi highlights the vulnerability of gibbons in particular. "Our discovery and description of Junzi imperialis suggests that we are underestimating the impact of humans on primate diversity. These findings reveal the importance of using historical archives such as the archaeological record to inform our understanding of conservation and stress the need for greater international collaboration to protect surviving populations of gibbons in the wild," said lead author, Dr Samuel Turvey (ZSL's Institute of Zoology). Eastern and Southeast Asia are currently home to some of the world's most threatened mammals, with 73% of Asian primates being threatened, compared to 60% globally. Two species of gibbon have recently disappeared in China, and all surviving Chinese species are currently classified as Critically Endangered by the IUCN's Red List of Threatened Species. The Hainan gibbon (Nomascus hainanus), a species of gibbon found on Hainan Island in southern China, is now probably the world's rarest mammal, with only 26 surviving individuals.